Some of the best stories I’ve ever written (by which I mean that I don’t cringe much when I re-read them years later) began with me trying to figure something out. I didn’t sit down at the keyboard thinking, “I’m going to write a story about a detective who left the force looking for the one who got away, and X, Y, and Z are going to happen.” Instead, I had a question I didn’t know the answer to, or an image in my head of a character in a situation and I didn’t know how they got there, or a snippet of conversation I had imagined between two characters and I was trying to figure out what they were talking about (or even who they were, sometimes)! I didn’t know what the story was, and I was writing to find it out. I wasn’t writing what I knew! I’m not saying that it’s wrong to plan out your plot or to chart your character arcs. I’m also not saying not to do research. What I am saying is that making art isn’t about re-hashing what you already know and assembling it into a perfectly constructed package. When I was a kid trying to write adventure stories I didn’t know what it was like to pilot a rocket ship to another planet. I didn’t know what it felt like to face a dragon armed with a shield and a magic sword. But I wanted to know what that felt like. So I imagined it and tried to write it. And I would go to the library with a list of things to look up in the card catalog. Yes, at ten years old I was tracking down books on piloting planes and about fighter pilots (because I knew most of our astronauts at the time had been military pilots), and bringing home books about sword-making and astronomy and geology and so on. One of the reason I usually had at least two stories in progress back then was because when I hit a point where I didn’t know how something worked that I needed my characters to do next (that I couldn’t figure out from the set of encyclopedias we owned and would require a library trip), I could pull the page out of the typewriter, set it aside with the rest of story A, and pick up story B. It was really frustrating if I had a snag in both. I would usually wind up picking up one of my fictions books (or going to the bookcase in the living room and see if any of my parents’ current fiction choices looked interesting) and reading until I thought of something to do with one of stopped stories. One of my favorite parts about moving back when I was 12 to the small town where I’d been born was that the library was close enough to our house that I could hop on my bicycle and ride to the library any time it was open. So I didn’t get stuck on those insurmountable snags nearly as often. The only limit to your writing should be your imagination. Yes, you will need to do research from time to time. Research isn’t just about going to the library or browsing the internet. You will be amazed how many experts in things are willing to talk to you if you ask politely. I got a tour of the county morgue just by calling and saying I was trying to write a murder mystery and didn’t want to just copy things I’d seen on TV. And the most fascinating thing about that was a nice long talk I had with an investigator that wasn’t about the process of an autopsy, but rather about the steps they go through to locate next of kin and gather information at the scene. Particularly heartbreaking from this investigator: he had a bundle of file folders of John and Jane Doughs (several of them teen-agers) that he was determined to identify before he retired. They’d been buried in anonymous graves. As he said, “All of them had to have been loved by someone sometime. They deserve a name and to be properly mourned.” I went in thinking I was going to learn how to describe an actual autopsy accurately, and came out with much more. Also, you want to be careful when you portray people and events from cultures other than your own (More research! Find more people willing to answer your questions!). But again, your imagination is the limit, not just your own lived experiences. 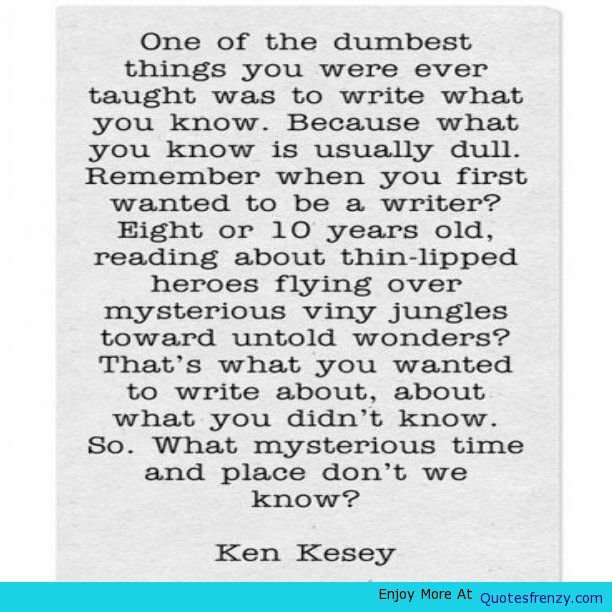 Don’t settle for what you know now: ask yourself what you want to know, and go write it!